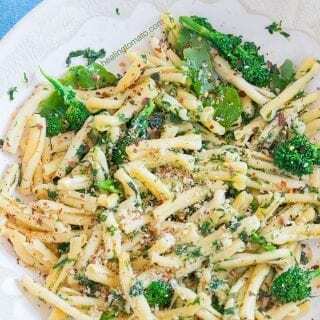 Vegan Casarecce Pasta made with Broccolini Rabe made with a rich vegan butter sauce and fresh herbs. Instead of using parmesan cheese, I opted for homemade panko breadcrumbs because its so much more fun to it! Best weeknight recipe ever! A person shopping in the grocery aisle asked me this question about seven years ago. That was the first time I heard of this pasta and it was love at first sight for me! “Ca-saa-reh-chi” is how you pronounce it. Its really fun to say it, so, try saying it a few times and see how much you will love saying it. Casarecce translates into homemade. I think the word Casa is giveaway, right? Basically, its a loosely folded pasta which makes them very light and fluffly. I found that its better to put them in simple recipes rather than dousing them in heavy sauces like Alfredo sauce or marinara sauce. This pasta is easily found in the pasta aisle and is often on sale in my local grocery store. 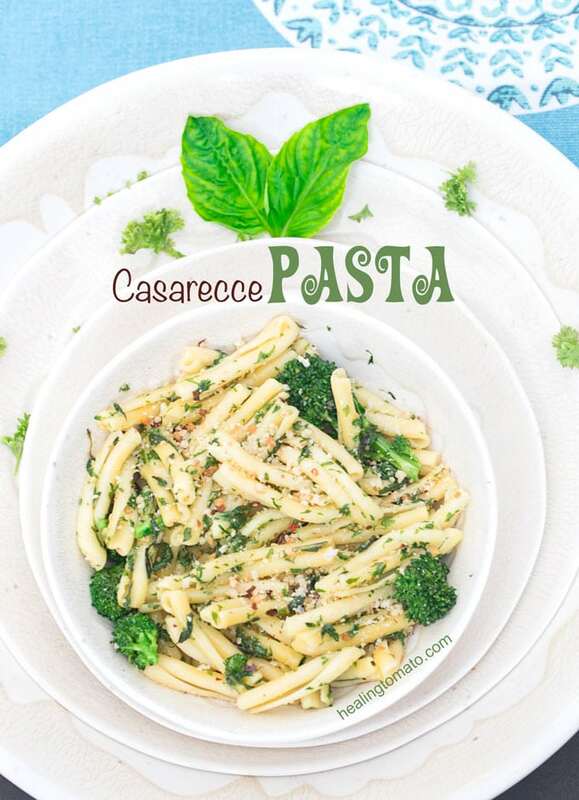 But, you can also buy authentic Italian casarecee pasta from (affiliate link) Amazon! What’s your favorite casarecce pasta recipe? 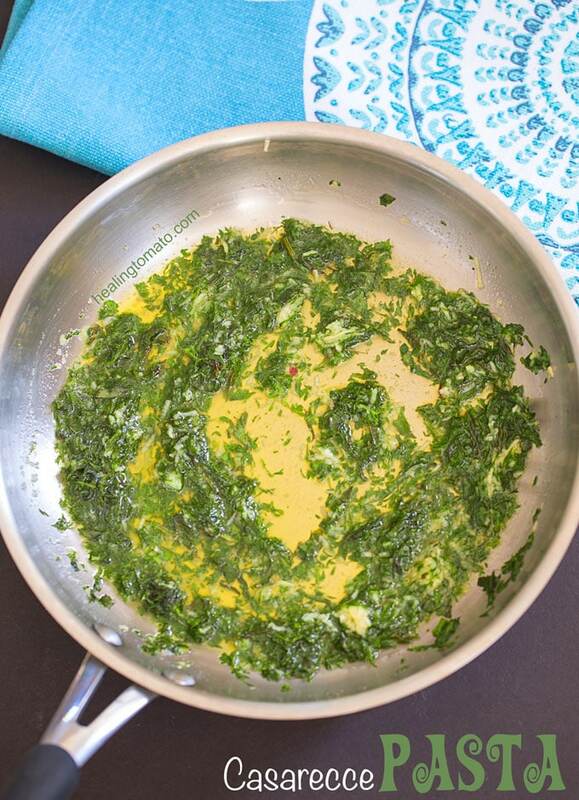 This is also the first time I have used broccolini rabe on my blog. Do you know the one surprising detail about it? I am sure you have figured it out. Broccolini rabe is not at all related to any member of the broccoli family. Broccolini, on the other hand, is a slightly sweeter vegetable. I like eating it raw just like regular broccoli. Broccolini is a relatively new vegetable. Broccoli and Chinese broccoli were sitting in a tree in 1993 and K-I-S-S-I-N-G! And that’s how regular broccolini came into existence! 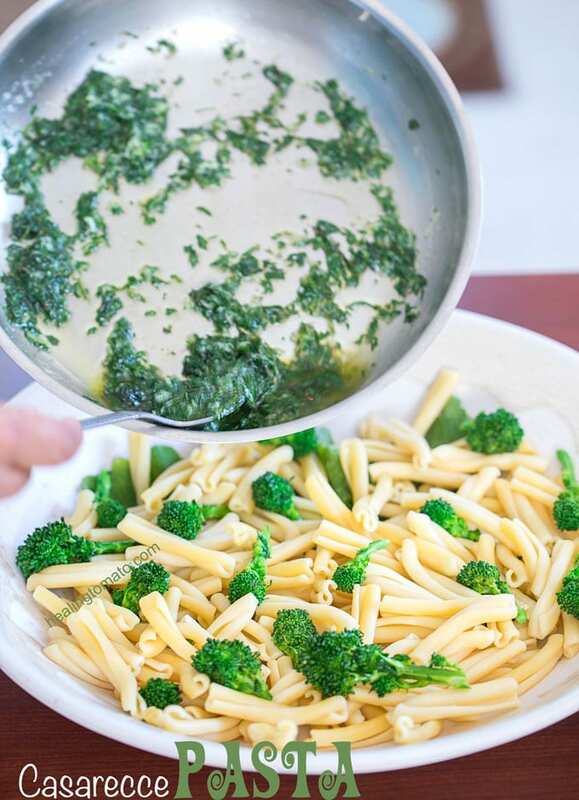 Broccolini is a hybrid of regular broccoli and Chinese broccoli which is why it is soooo delicious! To keep from confusing all these broccolis, broccolini rabe is also referred to as rapini. I prefer rapini too, because if you remove the ‘ap’ from it, it becomes ‘rini’! That’s totally a goofy way of remembering it’s name! Which one of the three is your favorite? How do you cook broccolini rabe? Unlike the other veggies that share its name, rabe doesn’t taste good when eaten raw! Trust me, I tried. 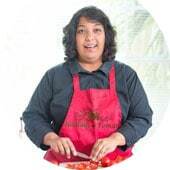 Learn from my experience and don’t eat them before cooking. It will take a few hours for the taste to leave your taste buds! I have found that roasted broccolini rabe is the best way to go. Also, I didn’t roast them for more than 5 minutes because I wanted to keep its green color and its slightly strong flavor. For this recipe, I suggest the quick roasting method because it adds just a hint of smokey flavor to the recipe. Plus, its faster than the blanching process. What to make when your herbs, garlic and bread is going bad? If you are following me on Instagram, you may have seen me complain about my food going bad! Look through my highlights and click on casarecce pasta story. I went through the process of using up my leftovers in this recipe. My mint, basil and curly parsley was losing its luster! They were going bad and I felt bad because I spent so much money on them. Does that happen to you too? Do what I did in this recipe. I blended them and added them to a vegan butter sauce and drizzled it on the casarecce pasta recipe. So much better than letting them go to waste! You can also make combination butter like my vegan basil butter using leftover herbs or this navy beans salad for leftover curly parsley. And if you are not following me on Instagram, you are seriously missing out on all the boring fun stuff in my life! Can you substitute bread crumbs for Parmesan cheese? I figured that it was be great time to test that theory! I toasted the bread quickly and then ground it into panko breadcrumbs. Let me tell you that its the best substitute for Parmesan! It added a little crunch to recipe while adding some flavoring to the pasta! I think it takes garlic a very long time to go bad. I have used it when it even though green stuff is growing out of it or it’s more brown than white in color. The only time I consider that it has gone bad is when it is mushy! Garlic doesn’t necessary go bad, but, it does become stronger in taste. It will be spicier, slightly potent in taste as it gets older. My general rule of thumb is to use it up within a month of buying it. I, also, refrigerate it which might not be wise, but, that’s the way I like storing them. 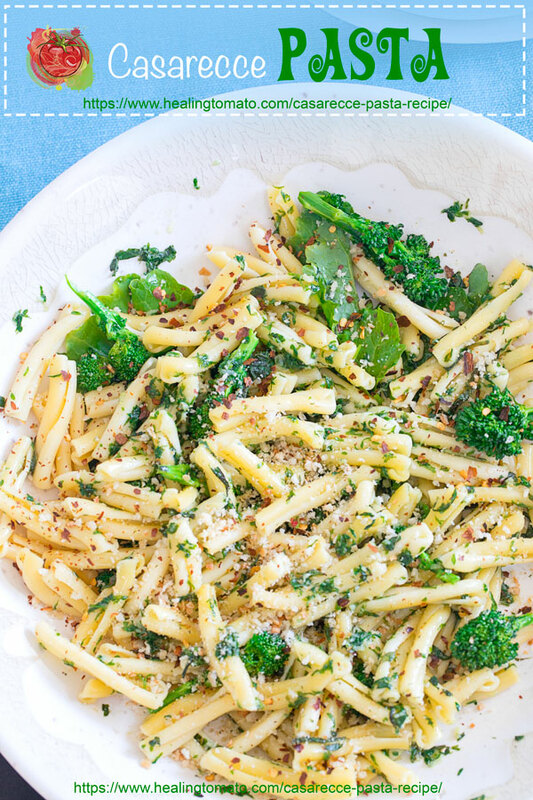 Just like my Pizza sauce recipe and my roasted broccoli, this casarecce pasta has tons of garlic! If you are looking for more peculiar pasta shape recipes, try my orecchiette pasta or my winter pasta salad. What’s your most favorite pasta recipe ever?! I am always a sucker for a pasta dish and the casarecce is one of my favorites. Usually I serve it with a bolognese but this light garlic butter sauce is perfect for it!! It was so delicious I didn’t have any leftovers for lunch the next day! Such an amazing pasta recipe!! I loved ll of the flavors!! This looks nice and easy. I’ll be able to make it even on busy weeknights! And talk about delicious! 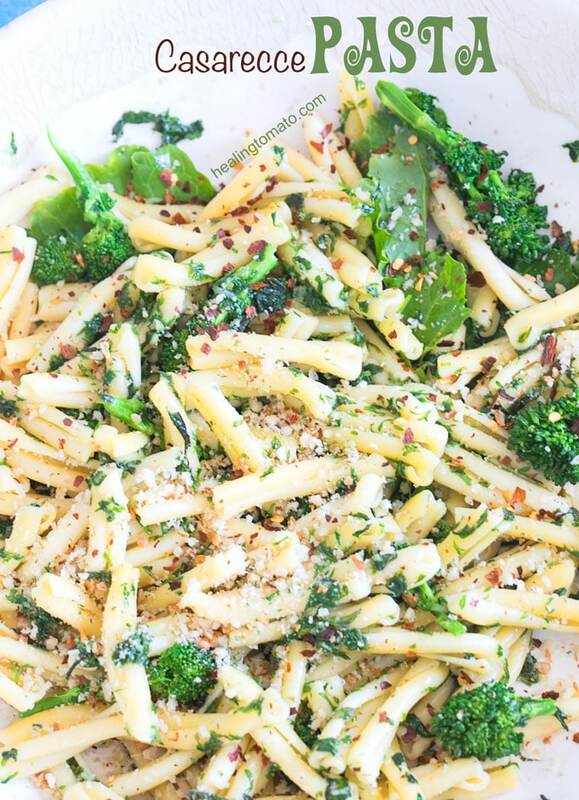 Aren’t we luck that broccoli and Chinese broccoli married into delicious broccolini! Like you, I love it raw, but making a delicious sauce is so cleaver and tasty! This looks like it’s going to be my new favorite pasta! I love all of the flavors and textures you have in this lovely meal! I love the idea of using panko as a sub for parmesan. This casarecce looks incredible!! Thank you, Kylee. I appreciate it very much. This looks so good and I agree the panko adds so much to the recipe. I recently discovered vegan butter and now I am sold! I love everything about this delicious comfort food dish! 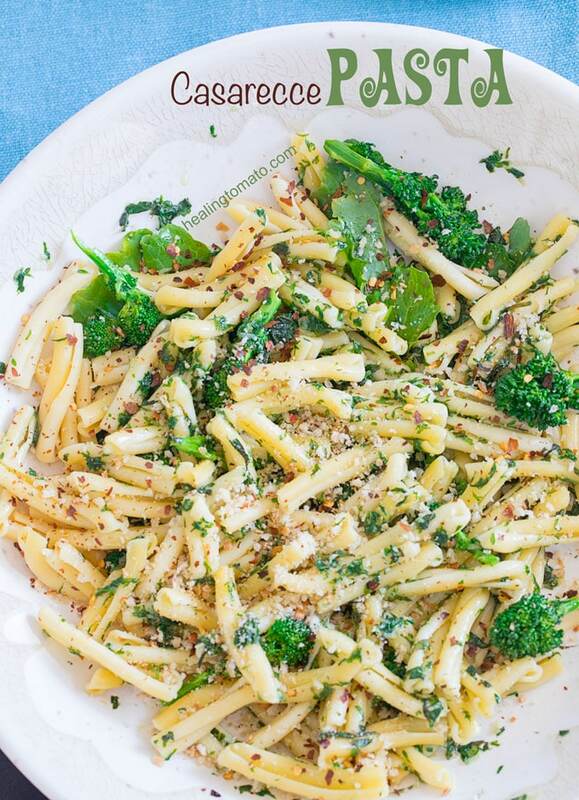 I buy more broccoli rabe than broccoli and can’t wait to try this new recipe for it! I’ll be craving this one for a while! YUM. This is my kind of pasta dish right here! 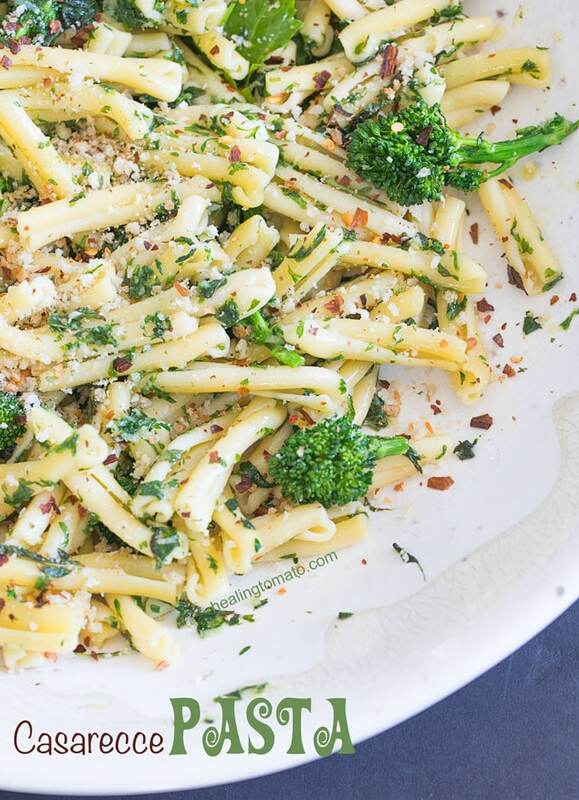 Love broccolini!